I am so very excited to announce that I am an auntie!Again! My nephew, Max Jacob Mendoza, was born on February 28th. 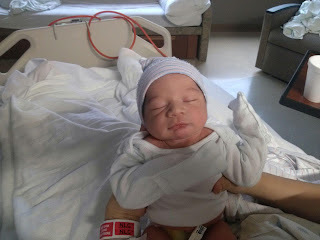 He came into this world weighing 6lbs, 14 oz. 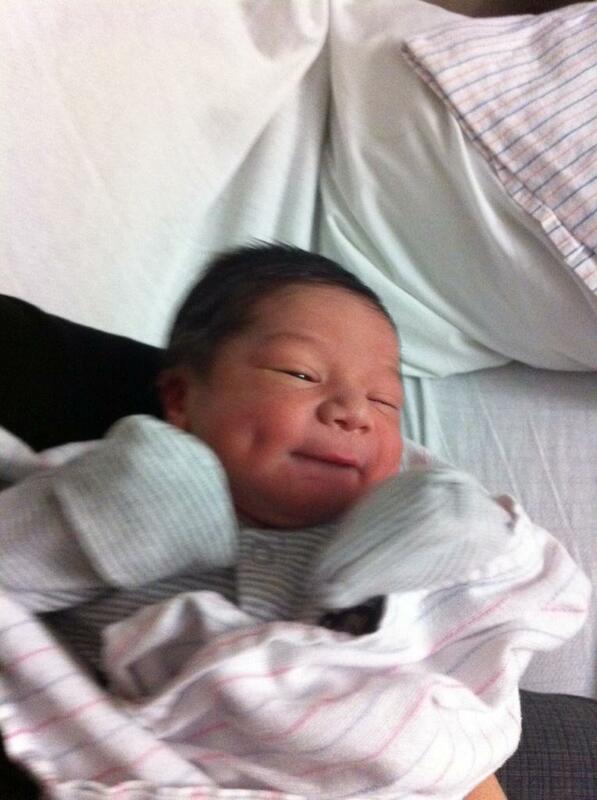 Already he is smiling just like his beautiful mother always does! I really am a very lucky girl to have two nieces and now three nephews! I love each of them so very much and wish I could be in their lives every day. As I blog about this, I have to wonder how Max or any of my other nieces and nephews will be digitally communicating when they get older. Will blogs still exist? How will people be sharing information? Or writing about their life experiences? I know when I was born, letters were still written and stamps were still used. I love thinking about what my nieces and nephews will get to experience as they grow older. I can't wait to watch them grow, take part in their life experiences and be their biggest fan! I am not sure if blogs will still exist when Max is able to read, but just in case, here is my letter to my new born nephew. Welcome to the world! We spent 9 long months, patiently awaiting your arrival and we could not be more excited that our family has now grown! It will be a few weeks before I get to meet you and hold you, but for now, know that I already love you more than you will ever know and can't stop thinking about how happy you have made our entire family. Even though your parents took a very long time to decide on your name, I think your personality and charisma are going to match perfectly with the name Max. You will probably be sassy like your sister, intelligent like your mother, and optimistic like your father. Now, the bad news...you are a second child. I am too, but let me let you in on a little secret....you will find many ways to use it to your advantage! Just when you think your older sister is getting all the attention, you start crying and your Nana will drop everything to help you. I am sure you are already giving this a try! And about that sister thing, you and I will talk long and hard about this in the future, so don't worry about handling the situation, I will tell you everything you need to know. Your sister is one of the most intelligent 2 yr olds that I have ever met and I am afraid it is only going to get worse. She is crazy cute and knows just how to wrap you around her finger. My sister is the same way. When we weren't fighting with each other, I would be admiring the amazing person that she is and always trying to emulate everything she did. So be tough and take the abuse that your sister is going to throw your way, but remember just how lucky you are to have a sister in your life. She will be there everyday and in ways you don't even realize. I am so very excited to meet you and get to know you better. You are a very lucky person to be born to two amazing people that will love you very, very much and you have grandparents that are going to spoil you like crazy! Your aunts and uncles will support you and cheer for you in everything you do. As you aunt, it is my duty to embarrass you with hugs and kisses at every opportunity, but I promise there is a cool side to me as well. Ask your sister about smoothie happy hours...they are all the rage in 2012! I may not say it enough, but always remember how much I love you and how special I think you are. Your life is going to be filled with a loving family that will support you in everything you do. I can't wait to hear about the adventures of Max and watch you grow to be an amazing person. Love always, your auntie missa.